​Aviation-grade aluminum is known for being incredibly strong. It creates a highly durable hiking stick. Equipeak's poles are crafted from 7075 aviation-grade aluminum, giving them the durability needed to survive years of trekking. Keep reading to find out why so many outdoor enthusiasts enjoy using this set of poles. It's even available in two sizes. ​This is a well-designed set of trekking, hiking, and walking poles from Equipeak. They are strong, lightweight, adjustable, and collapsible. ​Whether you are super active, have dexterity issues, or are simply impatient, Equipeak's poles delivers an excellent choice in a hiking pole. You'll discover these poles collapse easily, adjust simply, and transform into a sturdy walking stick in just seconds. You even get instructions clearly explaining how to do all of this. You have the option to select one of two different sizes, making this a suitable set of poles for men, women, and children. These poles fit anyone between 5.0 feet and 6.5 feet tall. This is a nice set for frequent fliers because they fit easily into your carry-on bag. ​This set of poles delivers exactly what hikers need for most types of journeys - from the adjustable wrist straps to interchangeable tips. The only additional item you may need to buy is a second pair to give as a gift. ​Let's get down to business. Here are the features that are going to convince you to either purchase this set or keep looking. Pole length is a critical component of any set of walking sticks. Having the correct height in your poles delivers ease of movement and alleviates the pressure on your knees. With this particular set from Equipeak, you have the option to choose the smaller size if you are 5'9" or shorter, or you can select the larger size if you are taller than 5'9". As an added bonus, adjusting the length of each pole is easy. Just twist, lock, and go. Adjustability doesn't stop just with your pole length, either. The wrist straps adjust, allowing you to maintain comfort no matter what type of incline or terrain you are traveling. When you need a quick adjustment due to a switch in ascent or descent, it's nice to be able to make it fast. The quick flick lock, which is set right at the top of your poles, is easy to use. It isn't often that you find a set of poles accompanied by every type of tip you can imagine. This set has it all - rubber, carbide tungsten, Nordic, and baskets. Serious trekkers and regular walkers can appreciate the dual benefit of a cork grip coupled with foam extensions. You avoid sweat and minimize shock. It's a win-win scenario. Equipeak uses 7075 aviation-grade aluminum because it is strong and lightweight. You get less arm fatigue when trekking and barely notice the added weight when you put them in your backpack. ​Learning to assemble and disassemble your poles isn't all that difficult. First of all, a set of instructions are included. If this is your first set of poles, read through them completely before you start. You can also watch the video below for assembly instructions. Once you set the pole length, you simply use the locking mechanism to secure the setting. It is easier to use the tightening knob if you have the clamp open while turning it. If you don't intend to collapse your poles, you can set the pole length, lock it in, and forget about it. Your poles will be ready for you next time you walk out of your door. ​If you aren't quite sold on this mid-range set of poles from Equipeak, you may be interested in Montem's collapsible carbon fiber poles. Their a high-end option offering many of the same features, but with a higher price tag. Montem poles offer support, balance, and flexibility. They are adjustable, strong, and collapsible. Accessories include carbide tips, mud baskets, and rubber tips. A flick lock secures your pole length, while cork handles keep your hands dry. The biggest difference between this set and the one from Equipeak is the carbon fiber construction instead of aluminum. Even so, the poles weigh only 7.6 ounces each. 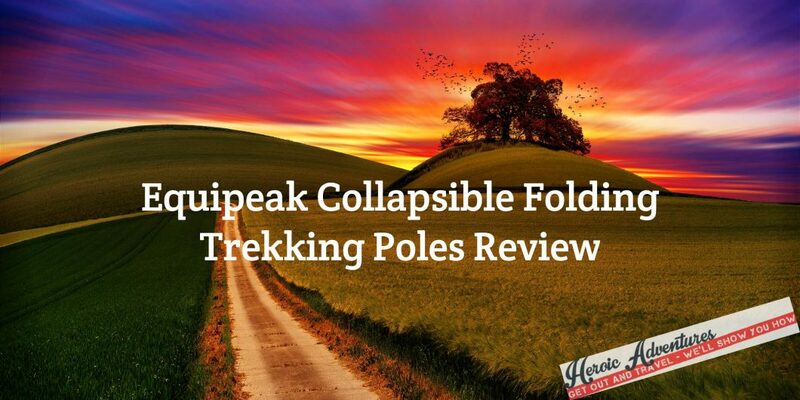 ​Equipeak's collapsible, folding, hiking, and trekking sticks provide an affordable, user-friendly option for walkers, backpackers, and trekkers. They are strong enough to deliver reliable support for your joints, especially the knees. You can go for hours and rest on your sticks for a short break as needed. Arm fatigue is sufficiently reduced to promote steeper inclines and longer journeys. Equipeak seems to understand the exact features you need to sustain a rugged, outdoor lifestyle. These poles do the work so you don't need to try so hard!